In addition to EVGA, MSI has also shown off their upcoming X99 motherboard prototype which makes use of the latest HEDT Express chipset.The Haswell-E platform which launches in September 2014 will feature the high-performance Core i7-5960X CPU featuring 8 Cores, 16 threads and a $999 US price tag. 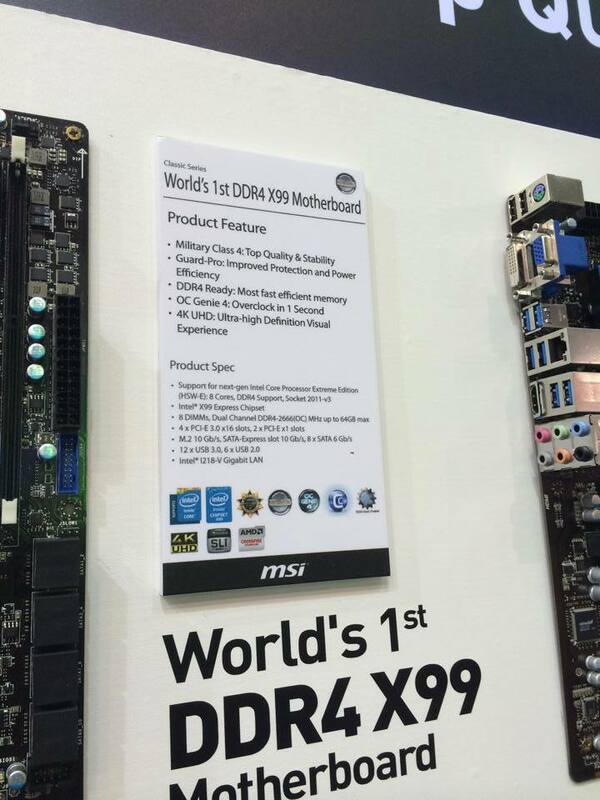 The MSI X99 motherboard is still an early prototype hence no name is mentioned but judging from the specs, I think that we might be looking at the next generation X99-GD65 motherboard since the design scheme is alot similar. 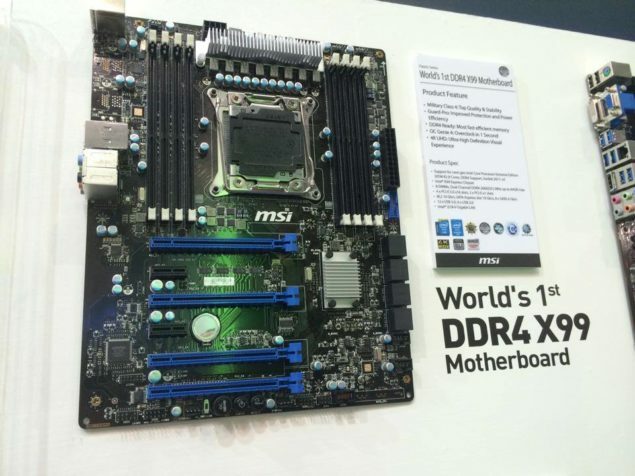 The motherboard comes with the blue and black color scheme which is the traditional color scheme that MSI uses on their legacy motherboards. From a technical perspective, the EVGA X99 motherboard features the LGA 2011-3 socket which is massive in size and supports Intel’s upcoming Haswell-E processors which include the Core i7-5960X, Core i7-5930K and Core i7-5820K. The motherboard is powered by an 8-Pin CPU power connector which provides juice to the socket while the 24-Pin ATX connector powers the rest of the board. The motherboard features a 16 Phase VRM design that offers Super Ferrite Chokes and Solid state capacitors that are part of the Military Class IV components. The X99 PCH sits beneath a smaller heatsink though this is just an early sample and the final heatsink would be much bigger and will look better. 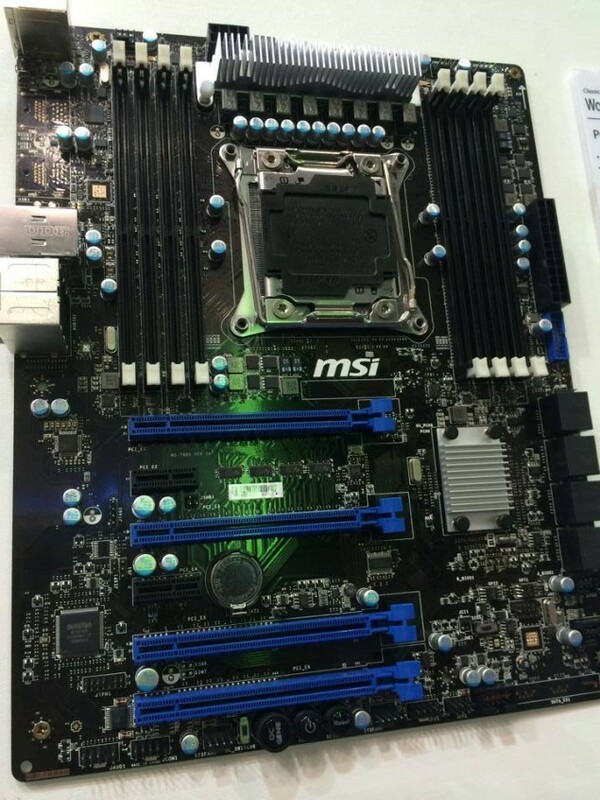 The MSI X99 motherboard prototype has a black colored PCB and retains the blue and black color scheme which like I mentioned, is part of MSI’s legacy lineup. Eight DDR4 DIMM slots are located on the board, four on each side of the socket which can support Quad Channel 64 GB DDR4 memory with speeds of 2666 MHz (O.C+) like the one we saw yesterday from memory makers Crucial and Corsair which are impressive from their design scheme There are some arrows and logos for future addons such as V-Check Points and OC switches but are not yet included. Expansion slots include four PCI-e 3.0 x16 and a two PCI-e 3.0 x4 slots, these are powered by the 40 PCI-e lanes from the processor itself. There’s no cheesy audio scheme on the motherboard but we can hope that this being a prototype didn’t include one yet. Right next to the PCH heatsink and a variety of ports, the eight SATA 6 GB/s ports along with a few fan headers and a USB 3.0 header. The I/O scheme includes a vairety of USB 2.0/3.0 ports (12 USB 3.0 / 6 USB 2.0), Intel 1218-V Gigabit LAN and an audio jack, the majority of the I/O connectors and ports have been left out due to the board being in prototype phase. Interesting thing is that the motherboard features M.2 SSD slot to support Intel’s NGFF form factor SSDs at 10 GB/s speeds.